There is no valid excuse for why it has taken me so long to finish this 2-part series! For all 3 of my readers out there, I apologize! In 2011, we have great plans for LOTS of content, romance & date ideas, product giveaways, interviews, marital challenges, book reviews, news commentary etc. We’ll talk more about that later… for now, we need to finish this months-old discussion on vision and your marriage. In this post, Part 2 of 2, I will share the conversation my amazing wife I had (and will continue having) as we discussed (and continue discussing) our vision for our marriage and family. 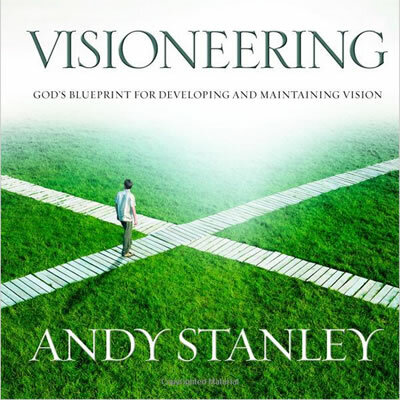 Since it has been a while, I will offer a very brief summary from Visioneering by Andy Stanley – Do You Have Vision for Your Marriage? (Part 1 of 2). A vision is a destination with a plan. It is the course by which you somehow pursue turning dreams into reality. It is the multi-faceted, intentional, and painstaking process whereby ideas and convictions take on substance toward a goal. My wife and I are at an interesting point in our young marriage. Over the past few years, God and marriage have absolutely and wonderfully transformed my heart in ways I could have never imaged. Back in the day, I was a power-hungry, money-focused, success-driven, “power of me” type of guy. I thought the answer to building the perfect problem-free life was to attain buckets of cash. I am blessed with a job that allows me to work from home. I love being home with my wife. I love not having to deal with an excruciatingly extended commute. I could probably secure a job with more prestige and a larger paycheck, but I would lose flexibility and the valuable resource of time. Also, my wife is in school full time and not currently employed. One day we sat down and started “vision casting” for our family. We often talk about where we are, but we rarely talk about where we are going. It is easy to get caught up in the busy-ness of life while haphazardly bouncing and floating along. In our discussion, we better defined the various formative routes we could pursue over the next few years. We definitely want kids, which are expensive. My wife could work and we could build a financial cushion. If she does not work , she may feel like her degree is “pointless”. I could pursue a different job that pays more. There are countless other options. We decided that building a large family focused on serving God, being actively involved in church, and trying to position our family so my wife does not have to work is our pursuit. Everything I know about scripture confirms this vision and ambition. So there is no confusion, I am not suggesting that people in other situations are anti-Jesus. However, I am asserting that our vision does not contradict or conflict my understanding of God’s vision for marriage and family. There will be consequences of our decision. We may not travel as much. We may not see as much of the world. We may not have the newest and swankiest gadgets. Our home may not have the fanciest furnishings. We may not drive the nicest vehicles. We may not have the largest retirement. However… we’ve decided that’s OK. The vision we have for our family is worth the tradeoffs. It is easy to confuse “tradeoff” and “sacrifice” in this discussion. “Sacrifice” maintains a negative connotation and often suggests that you are “giving up” something greatly valuable. Tradeoffs simply involve active choice and focus. Deciding to prioritize our family and not acquire stuff and experiences is NOT a SACRIFICE. It is a choice and opportunity to experience joy in God’s design of the family. It requires evaluating opportunities, situations, and potential distractions against the vision, and intentionally deciding to choose and serve the vision. Note: We do not currently have children, but hope to one day, by birth and/or adoption. For this discussion, I will speak of the children we hope to have. With this vision, there will hopefully be eternal gains, benefits and realities associated with the tradeoffs. Instead of more money and experiences, we hope to gain the following. More time to be attentive, unified, madly in love, and engaging spouses and parents. Build a family and nurture children that know, serve, pursue, and genuinely love God and His Church. Model a Kingdom-focused mindset to our extended family and children. Richer, more peaceful, and deeper relationships with each other, our children, and God. Multiple and leave a legacy of soldiers for Christ who are laser-focused on loving others and winning souls for eternity. My wife and I are two people, but we hope to leave behind have 4-6 children. We believe pouring our finances, efforts, time, education, experiences, and other resources into our family and church is both ordained by our Creator and more valuable than anything else. This is our dream. This conversation does not just “happen”. You have to pray about it separately and together. You have to test it against the Word (which means you have to know and pursue the Bible!). You have to build accountability with each other and with other believers. You have to intentionally evaluate it during the journey. You have to establish this conversation, focus, and evaluation as a foundational culture in your marriage. Doing this builds the essential resolve that positions the vision as possibility, and enables it to actually come fruition.